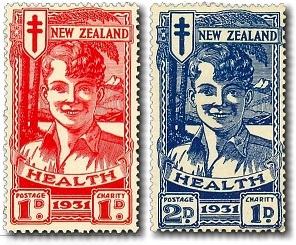 The 1931 red and blue smiling boys are the best known and rarest of all the health stamp issues. The stamps feature a smiling boy with a New Zealand lake and mountain landscape in the background. The four stars of the Southern Cross constellation appear to the left of the Anti Tuberculosis cross. Originally intended as the design for the 1930 health stamps, the issue was beset by problems from the beginning. The 1d plates were prepared in London by the Royal Mint. When they arrived in New Zealand it was discovered that the vertical spacing between stamps did not allow sufficient clearance for the comb perforation machine. The plates were cut and metal spacers were inserted but the end result was stamps that were quite often poorly spaced. In June 1931 postal rates were doubled. Letters increased from 1d to 2d and commercial postage from Â½d to 1d. In light of this, it was decided to issue two health stamps and W.R. Bock was commissioned to produce a new 2d plate from the original. The set was issued at the height of the world-wide financial depression and sales were small. In all around 75,000 of the red boy and 112,000 of the blue boy were sold. However, the blue boy is harder to find mint.